Cordless curling irons are a wonderful technology. Curling irons with cords can be so limiting as they restrict the distance you can be away from a mirror, while also preventing you from using them in a place with no plug. Moreover, for those traveling with their curling iron, they don’t have to worry about adapter plugs or dual voltage, as a cordless curling iron works without mains electricity. That said, it is important to consider the different options available to you. 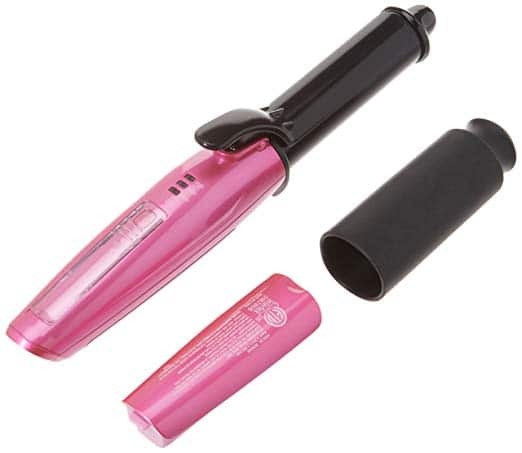 Cordless curling irons are typically powered with either butane or rechargeable batteries. Each option comes with its advantages and disadvantages so make sure you consider your lifestyle patterns when making the choice. Cordless curling irons can be such a bonus. You’ll find that, usually, curling irons are limited to the length of the cord. A cordless curling iron doesn’t have these limitations, meaning that you don’t have to reposition your mirror near a plug. This can be especially true for people who only have a mirror in the bathroom, where you’ll rarely find a mains electricity socket. What’s more, even though most curling irons feature a rotating cord, you will find that often this cord still gets twisted while you work. Cordless irons are free from this issue. Equally, for those who travel a lot, you will need to have dual voltage for your curling iron if it requires mains electricity. Moreover, you’ll usually need to purchase an extra plug adapter. Not only is this an extra cost, but it can be bulky in your suitcase. A cordless curling iron doesn’t require either of those things, making it a far better travel companion. This is especially true of cordless curling irons that recharge using USB chargers as they are the most adaptable tools to reload. Cordless curling irons tend to always be smaller than regular curling irons. This is a great advantage for those traveling, as well as people with shorter hair. This also makes them lightweight, which prevents your arms from aching, and makes them easy to pack in your suitcase. Butane curling irons work with a small cartridge of butane. The butane gas burns, which heats up the curler. When this cartridge runs out, you replace it with a new one. These curling irons are usually quite compact, making them great to pack in your suitcase. However, they tend to heat up quite hot and it can be expensive to continuously replace the cartridges. Moreover, the cartridges can be hard to find abroad, and if the company stops making that model, you may not be able to find them at all. It is also important to consider the way in which you travel. For some people who only carry hand luggage, a mini cordless curler seems like a great option. However, many butane curlers cannot be carried in hand luggage, with the same going for the spare cartridges. Bear this in mind or you may lose them when you check-in. Battery powered curlers are usually rechargeable. This means that you don’t have to keep paying for cartridges. Some come with USB chargers, whereas others come with mains chargers. They tend to last between 30-50 minutes on a single charge, which is enough time to curl your hair twice. USB chargers are more versatile as they can be charged abroad, whereas the problem with mains chargers is that you will need to have dual voltage and an adapter if traveling. Make sure to consider how long the curler takes to charge and how long it holds charge. If you have long or thick hair, you will need a battery-powered curler that lasts for a longer time between charges. Unfortunately, many battery-operated curling irons only last for 20 minutes before they need charging again. Equally, sometimes they may take a long time to recharge. Cordless curling irons come with their own drawbacks. Firstly, they tend to be smaller in size than regular curling irons. While this may be a bonus for traveling, it can make them difficult to use with long or thick hair. 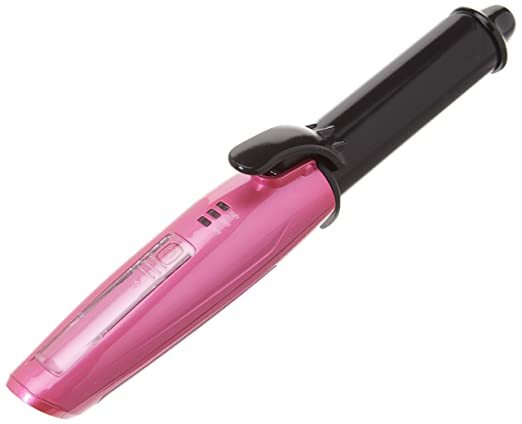 In addition, you’ll find that as battery-powered curling irons run out of battery, the heat decreases dramatically. You may not notice which will cause some of your curls to drop out more quickly than others throughout the day. Equally, when they do run out, you have to wait for them to recharge. If you forget to recharge it, you may have to wait up to 30 minutes before you can curl your hair. As noted above, those with thick and long hair may want to pay special attention to how long these curling irons hold charge for, as some of them barely hold charge for longer than 20 minutes. This will dramatically increase the time it takes to curl your hair, as you’ll have to recharge halfway through. Butane curlers can be an issue for those traveling. As noted above, the cartridges can be hard to come by. As there are fewer butane curlers in existence, this makes the cartridges expensive to replace. Equally, it is a constant cost to replace the cartridges, unlike regular curlers which only cost when you buy them. Not only is this an added cost to your life, it is not very environmentally friendly as the cartridges cannot be recycled. This mini curler has a ¾ inch ceramic coated barrel. 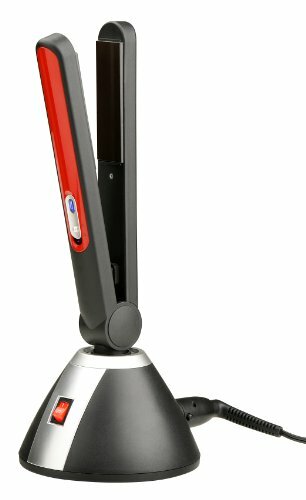 It is a butane cordless curler that heats up to 360F. It includes a butane cartridge and has been approved as safe to travel with on flights. This curler is tiny and lightweight which makes it great to travel with and easy to fit into your suitcase. The ¾ inch barrel is perfect for people with short hair. It comes with a snap-on cover which helps to protect your hands from burning and doubles up as a stand while you use it. It doesn’t heat up very high, which makes it a poor choice for people with hair that is hard to curl. That said, it heats up a little too high for people with fine hair. When it heats to its maximum temperature, you can smell the butane quite strongly. It is only coated in ceramic which doesn’t provide the best heat distribution, which can be an issue for fine or damaged hair. This model features a ceramic barrel that heats up in around 60 seconds. It is fueled by butane and features a ⅞ inch barrel. It is compact for traveling and comes with one butane cartridge and a carry case. Each cartridge lasts 11 weeks and cartridges can be bought in packs of 6, which is said to last the average person a whole year. This is great value for money. It has a heating range of 275F to 365F making it a great choice for versatile styling. It is also suitable for people with fine hair. It features a ceramic barrel which protects the hair and produces a shinier result. It comes with a heat-resistant pouch, so it can be put away almost immediately, making it a great tool for on-the-go. It is quite small and therefore not suitable for long or thick hair. This model is quite old so the cartridges can be hard to come by and sometimes expensive. This is a flat iron, rather than a curler but can be used for curling. It comes with a rechargeable base. It comes with 1 inch ceramic plates. This model heats up quickly on the charger. It has ceramic blades which protect the hair and give even heat distribution. This is a flat iron so it can straighten your hair as well as curling it, making it a somewhat more versatile instrument. It only stays hot for about 5 minutes before having to put back on to the charger. Some customers complain that it barely stays hot for that long and loses heat very quickly, after about 2 minutes. It needs to stay on the stand for 2 minutes every time it gets put down, which drags out the process of curling your hair. It’s a flat iron and has quite straight edges, which can put kinks in the hair. The charger needs to be plugged into the mains and is bulky, which makes it less ideal for traveling. It has a fixed temperature of 365F, which is not hot enough for tough hair and is too hot for fine hair. This curling iron has a ceramic barrel and features three heat settings. It is lightweight and stays hot for about 20 minutes in between charges. The barrel is roughly an inch wide and it features dual voltage. Dual voltage charger makes it better to travel with. You only need to purchase an adapter. There are three heat settings: 280F, 320F and 350F. This makes this ideal for people with fine or damaged hair. It also allows for versatile curling styles. The ceramic barrel provides good heat distribution preventing damaging hot spots. It comes with a wall and car charger. This only stays hot for 20 minutes at a time before needing to be recharged. This can be an issue if you have lots of hair as you’d have to wait for a recharge halfway through. It doesn’t get all that hot making it unsuitable for people who have hard-to-curl hair. 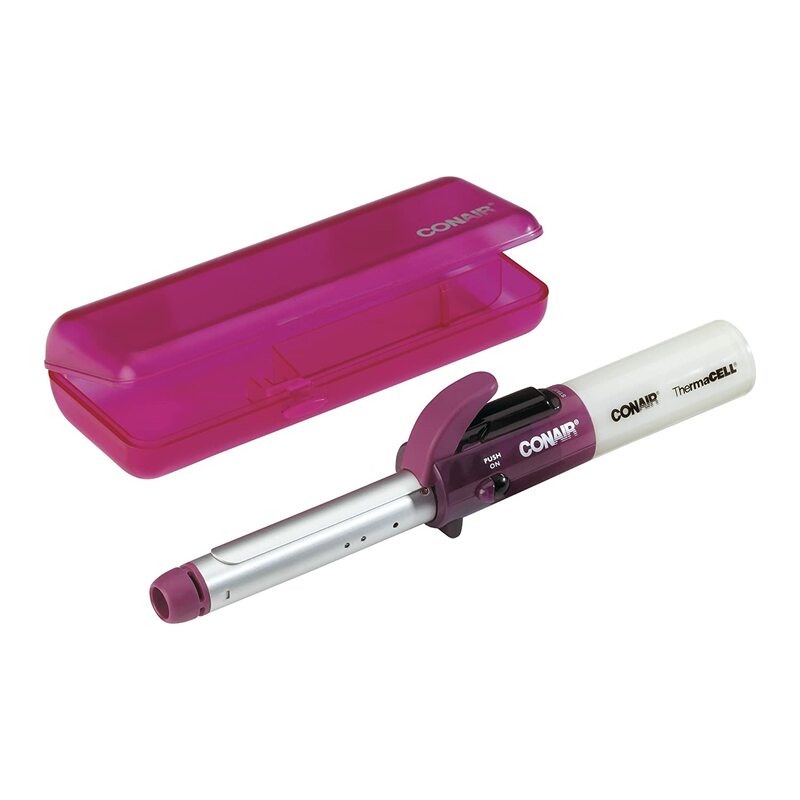 Complete with carry case, this miniature curling iron is powered by butane. The ceramic barrel is ⅝ inch wide and features only one heat setting. The butane cells can last around a month for each one. The barrel is ceramic which helps to provide protection to the hair. It is an extremely affordable price and so are the replacement cartridges. It comes with a carry case which makes it easy to travel with, without it getting damaged. 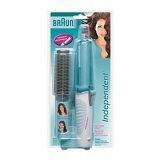 It only has one heat setting making it unsuitable for fine hair, and reducing its versatility in styling. The barrel is very thin, which means that it gives quite tight curls, making it less appealing to people with long hair. Spare cartridges cannot be carried in hand luggage. "It's so small and it's so cute! It's cordless you can take it anywhere." Cordless curling irons are a great choice for people who are tired of getting themselves wrapped up in the cord or need to have more flexibility with the location they curl their hair. Try to think about your lifestyle when choosing which one suits you. If you are on a constant budget, try to find something that recharges rather than a butane cartridge curler. This is equally true for people who have an affinity to environmentally-friendly products, as the butane itself is bad for the environment, coupled with the waste from the cartridges. That said, try to find a rechargeable product that stays hot long enough that you don’t need to keep recharging it, or this can be a pain to work with and just as bad for the environment.